We love to camp at our house, but sometimes it’s hard to find the time to get away for a real camping weekend or the weather just won’t allow it. 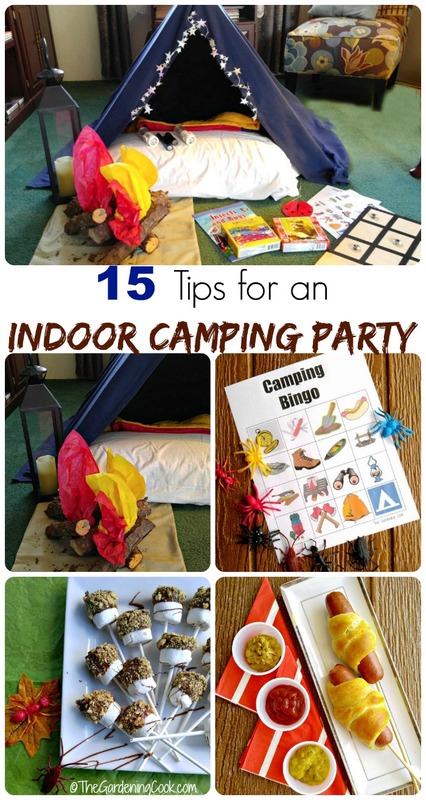 For times like this, the kids can still have a lot of fun by having an indoor camping party. It is really just a matter of setting the scene, with the right food and decor, and the kids will have a blast every time. For most of us, a camping trip is something that won’t happen until next summer. But not at our house. This indoor camping party will have everyone saying Life’s an Adventure, in unison! 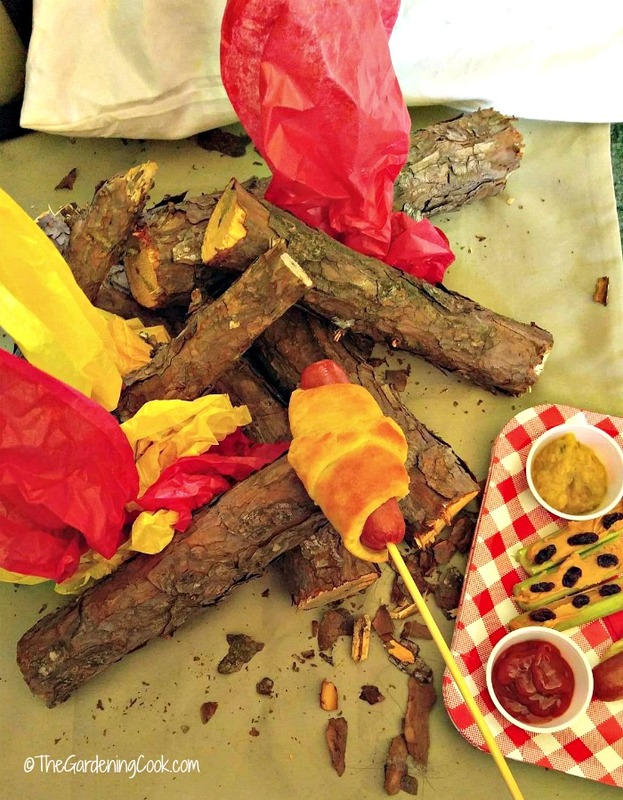 Whether you have great camping weather outside, but you don’t have time, or it’s raining cats and dogs out doors, (or snowing up a storm) these tips and tricks will make sure that thoughts of hot dogs, s’mores, critters and other camping fun is not just a dream, but a reality. 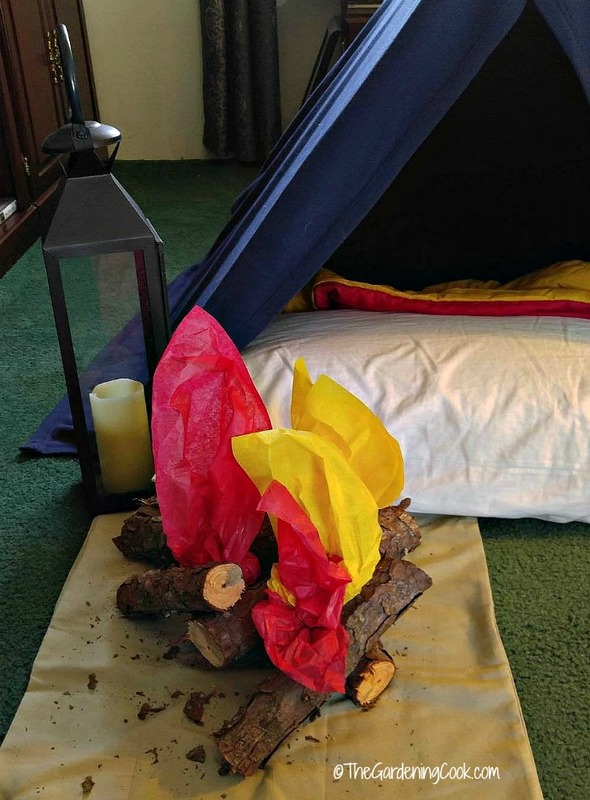 Even if you are not able to camp outdoors, you can still give you kids a great indoor camping party, with these 15 tips, food ideas, and activities. 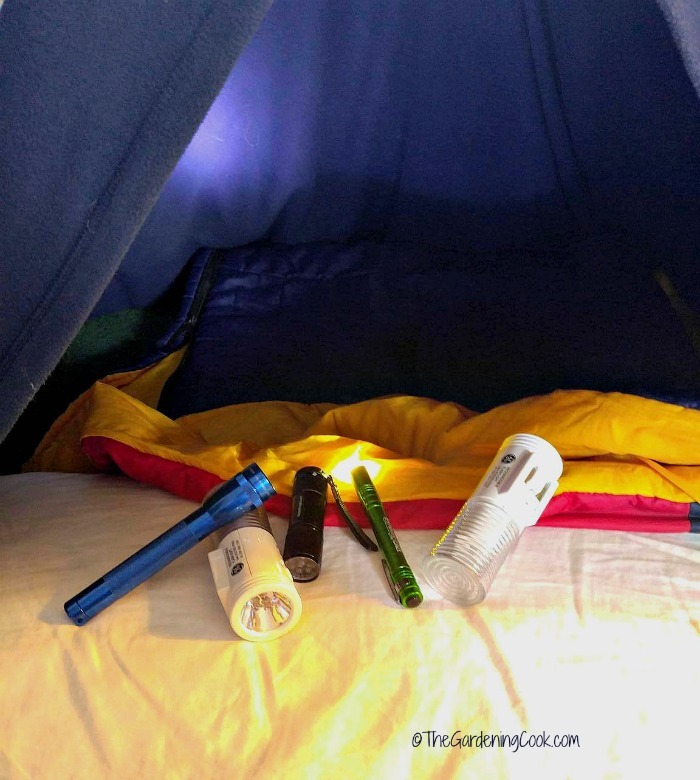 These tips and tricks will have your budding campers enjoying the outdoors indoors in a flash. 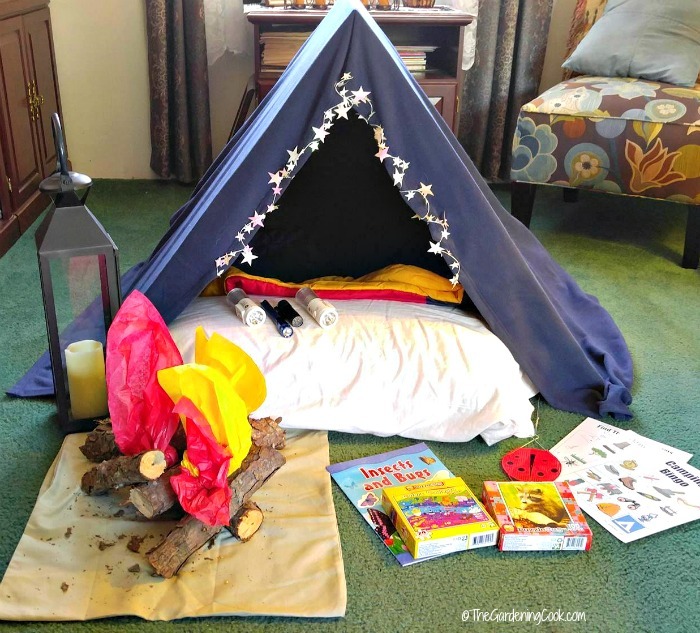 So, it’s time to gather ’round your campfire, pitch a tent and get ready to explore the wilderness of the great indoors with these great games, food ideas and activities. The most important part of camping is the tent. 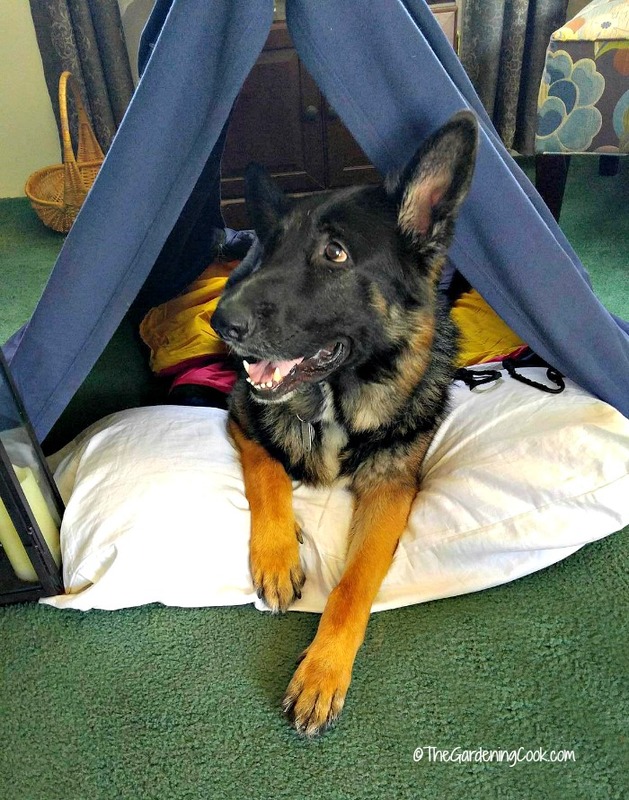 If you have a pup tent, go ahead and set it up, but you don’t really need one. You could just as easily arrange some kitchen chairs in two rows and drape a blanket over it. 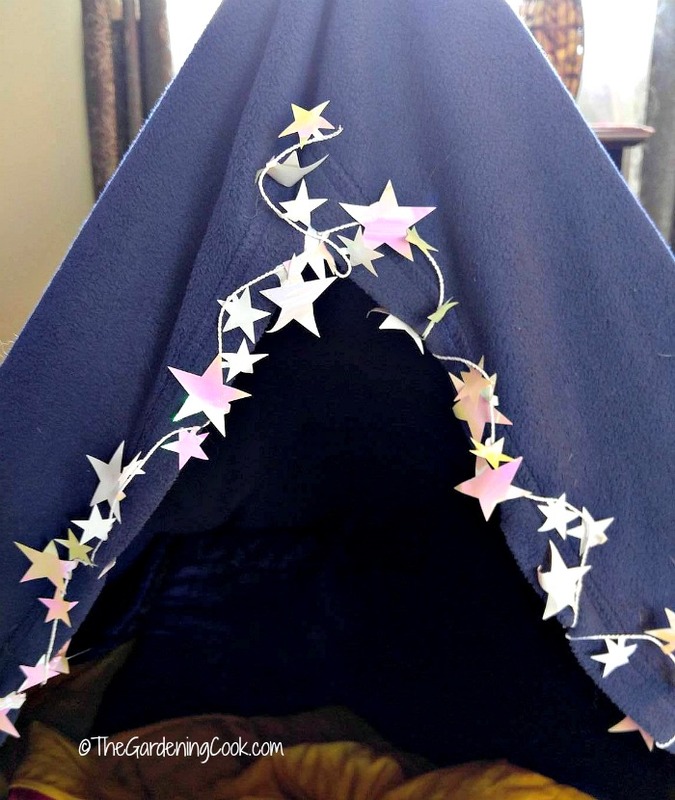 For our party, I used two pieces of plywood, some heavy duty duct tape to hold them together in a large triangle and draped a soft medium blue blanket over the top. I chose the blue color because it looks like a dark outdoor evening sky. It’s the perfect size for the kiddos, too. 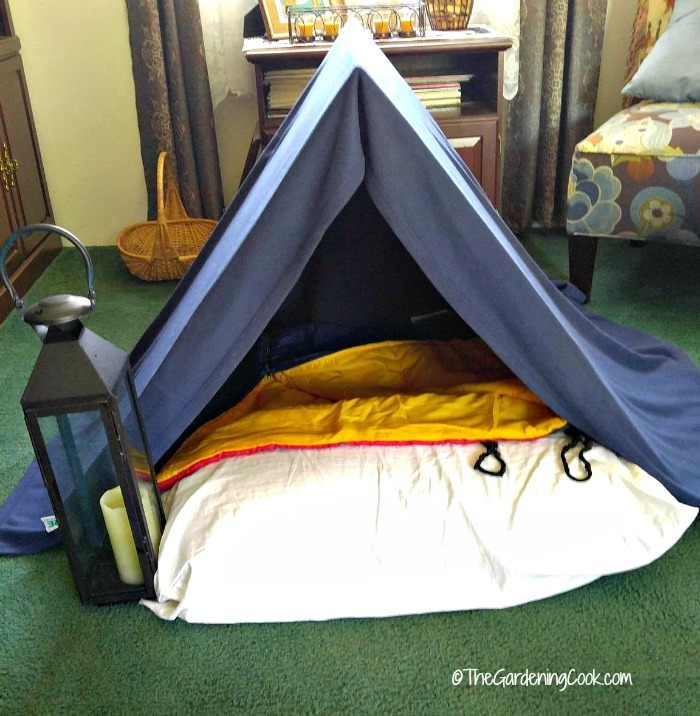 Just add a comfy pillow and child’s sleeping bag and they will have their place to sleep. I like to re-purpose craft supplies. 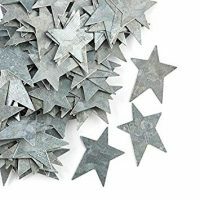 For my night time stars, I used a Fourth of July table decoration with stars on it and removed the stars. I attached the the stars to the edges of our indoor camping tent to set the mood for a night outdoors. 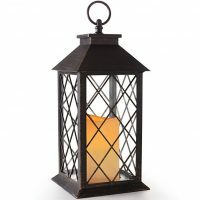 A large lantern with a candle inside of it helps to set a night time mood, and if you have a dimmer switch in your room, this can be set low, too. Arrange a few logs from outside in a stacked pattern and add some orange and red tissue paper to resemble flames. We had an old tree branch that was the perfect size, and my husband cut it into short lengths with a chainsaw. I arranged it in a the “campfire” design. The kids are asking for hot dogs to cook on the fire already! 4. Hot dogs are King! No camping trip is complete without some hot dogs. My favorite ones to serve are Ball Park® Hot Dogs. They come in several varieties and sizes. I am making the hot dogs wrapped in crescent dough and baked in the oven for our indoor camping party. A bamboo skewer inserted in the middle will have them kids thinking that they toasted them for themselves over the make shift campfire. What fun! To see how to make them, just print out the recipe from the recipe card at the bottom of the post. No camping trip would be complete without some s’mores. 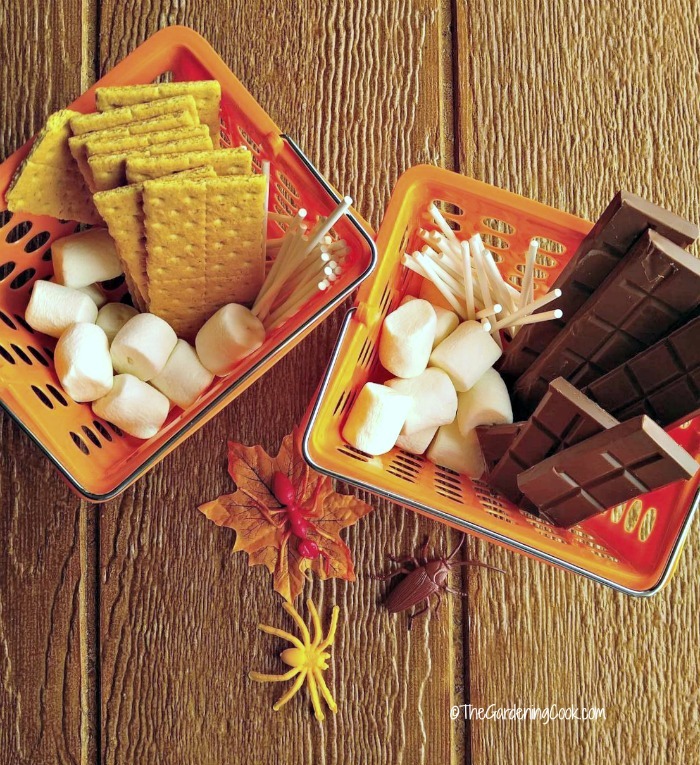 These graham cracker, chocolate and marshmallow treats are the highlight of any fun indoor camping party. I made a S’mores station for the kids. Our s’mores will be made in the microwave instead of over a campfire. 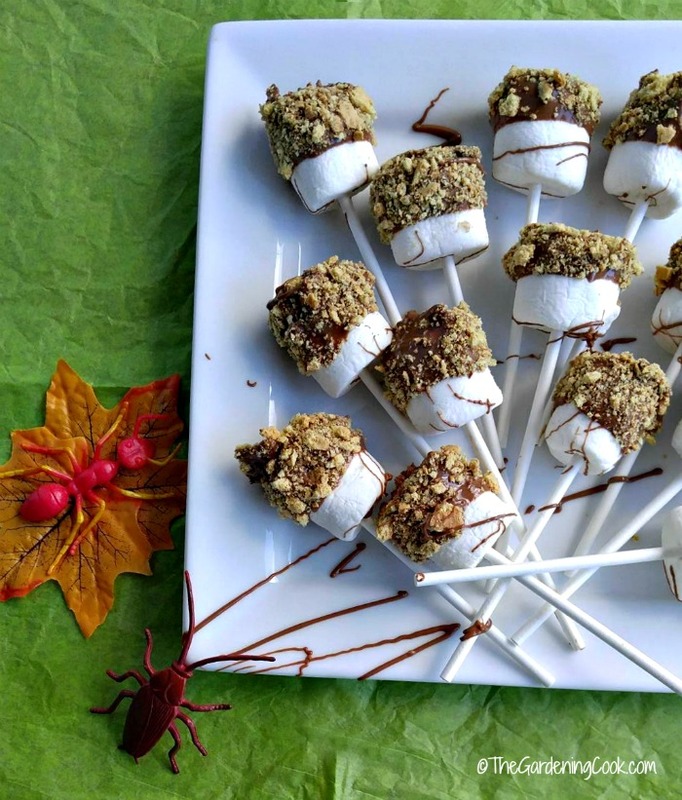 We’ll serve them on a stick, with the marshmallow dipped in chocolate, and then rolled in graham cracker crumbs. The kids can do pretty much all parts of this recipe and will love making them, too. What fun! These indoor S’mores are gooey and chocolatey and make the perfect camp fire snack. Be quick though. Don’t let the bugs get them! See the recipes for these indoor s’mores at my holiday site. 6. Scavenger Hunt. 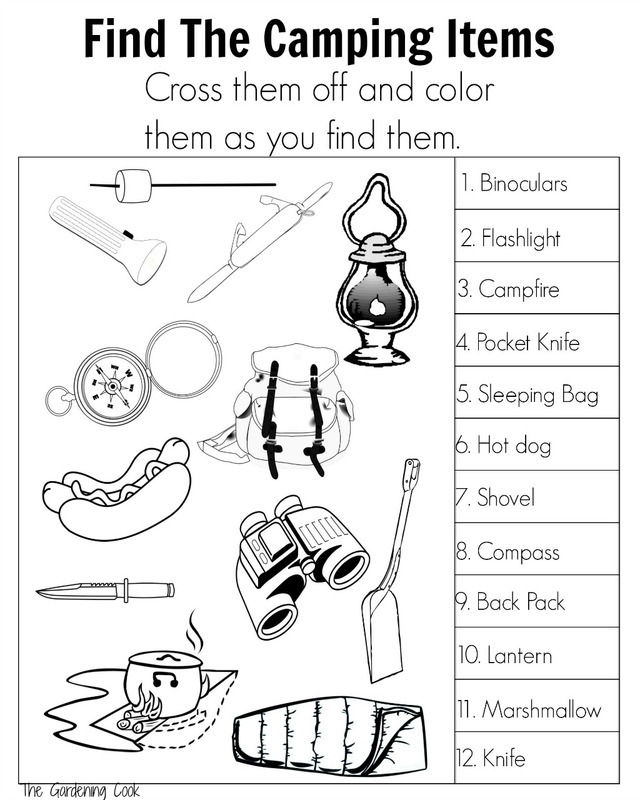 Weather permitting, it’s now time for the kids to head off outdoors for a scavenger hunt. 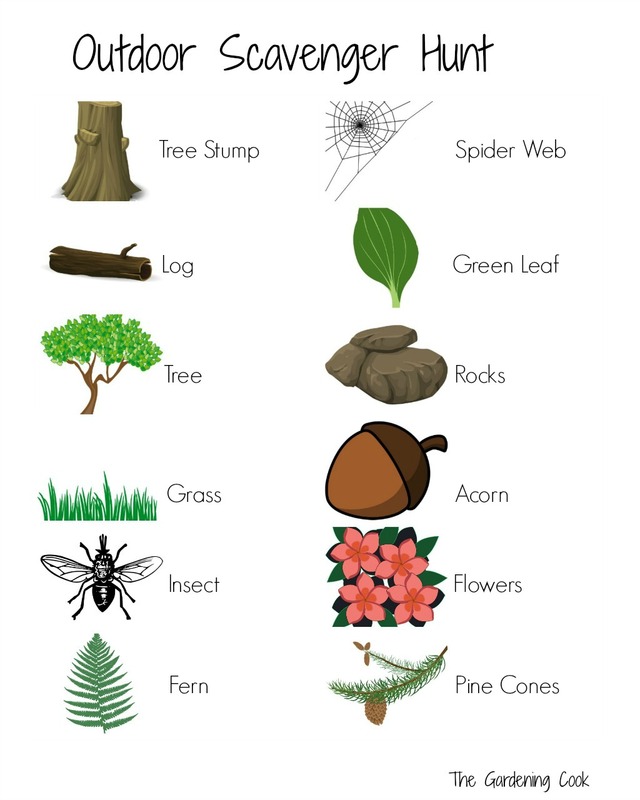 Print out this free Scavenger Hunt printable and have the kiddos tick off the items in your garden as they find them. Most are items readily found in any yard or garden and should not be too hard to find. Letting the kids run around outside for a while will also tire them out a bit as they scamper around looking for things to find. If it’s too cold outside, the items can be hidden around the house instead. Do they still have a bit of pent up energy and excitement about their indoor camping party? 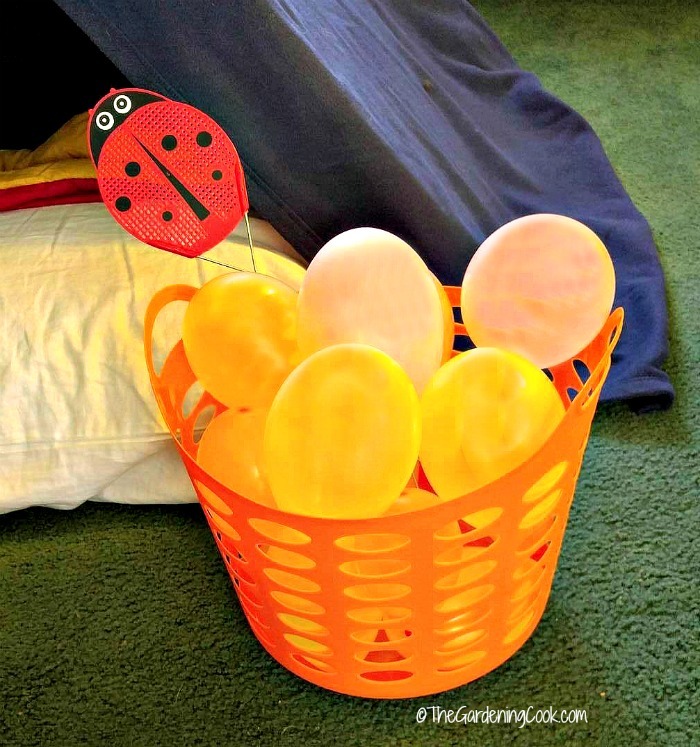 It’s time for some active indoor fun with this simple to make Balloon Tennis Game. Playing this will let them release some of their energy, but won’t damage your surroundings. I chose balloons in the color of a campfire and placed them in a large orange basket. A cute ladybug fly swatter is the tennis racket. You can relax, knowing that the kids will not damage anything with the lightweight balloons. And think of the fun they will have popping the balloons later when the lights are turned down low. I don’t know about you, but every camping trip that I have gone on has had lots of ants nearby. But, this time, our ants are of the edible variety with these fun ants on a log. 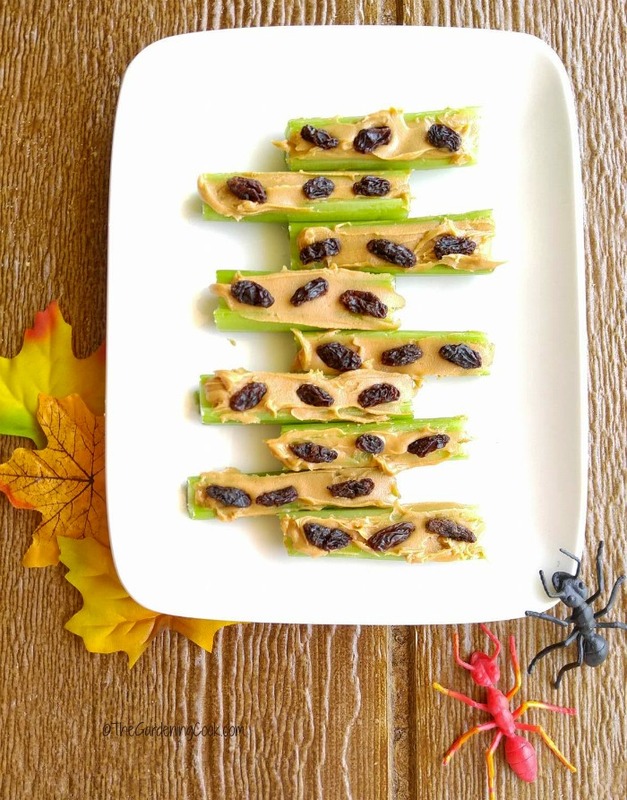 Just spread some peanut butter on celery and add some plump raisins to resemble ants. I squeezed the raisins in the middle to make them longer and more ant shaped. The kids will squeal with delight at the thought of actually eating the ants! 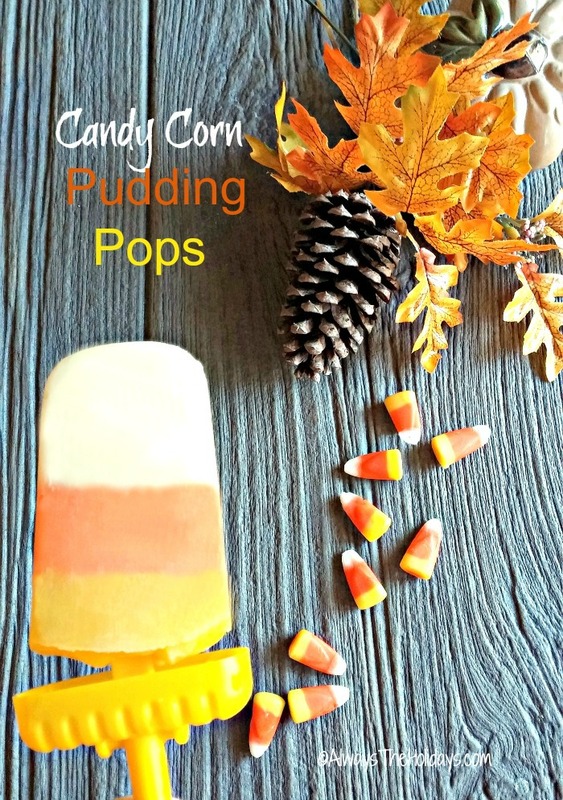 These delicious candy corn pudding pops have the color of a campfire and will make the perfect, healthy ending to the indoor camping party menu. 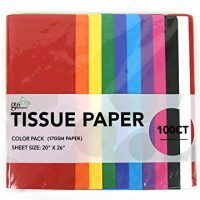 They are also perfect for this time of the year! You can make them ahead of time with the recipe found on my holiday blog. Now it is time for some quiet indoor fun. 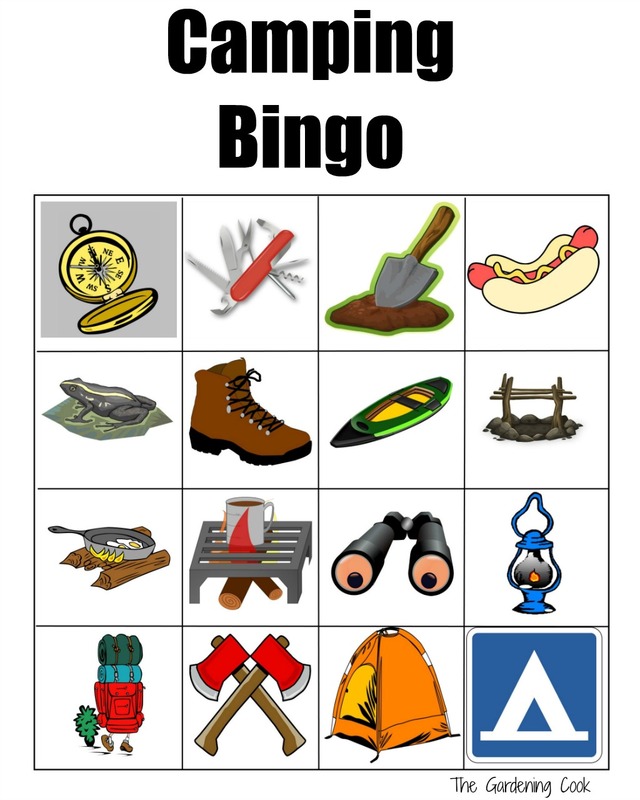 Print out this fun Camping Bingo sheet for the kids to play. To play the game, give the children some plastic bugs to use as markers. 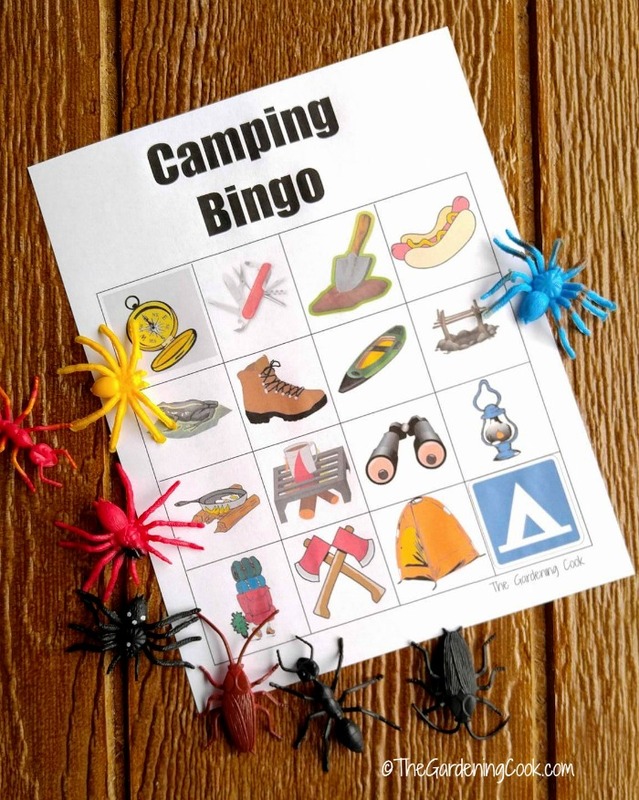 The kids will enjoy finding the camping items, and the bugs can be used later as party favors for the kids to take home. What child doesn’t love bugs, after all? 11. Time for Tic Tac Toe. 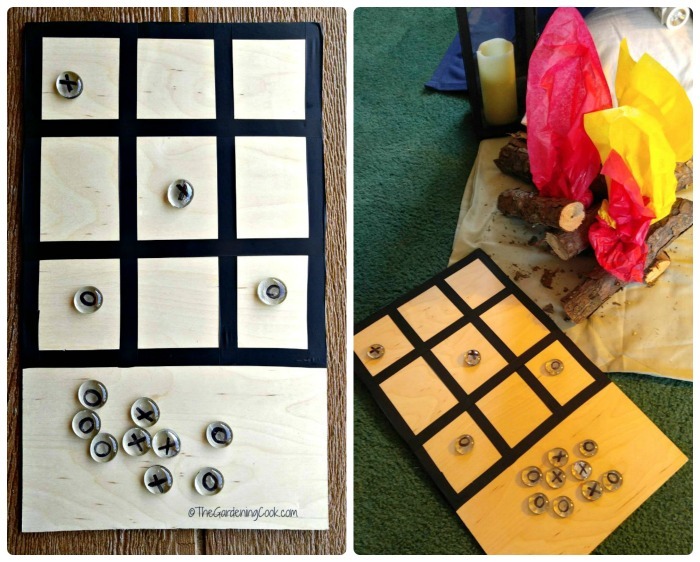 This indoor tic tac toe game is so easy to make. Just cut a piece of plywood and use black electrical tape to mark the grid on it. Clear glass rocks with Xs and Os painted on them are the markers. See if you can get three in a row! 12. Camping Find and Color. All kids love to color and find things. 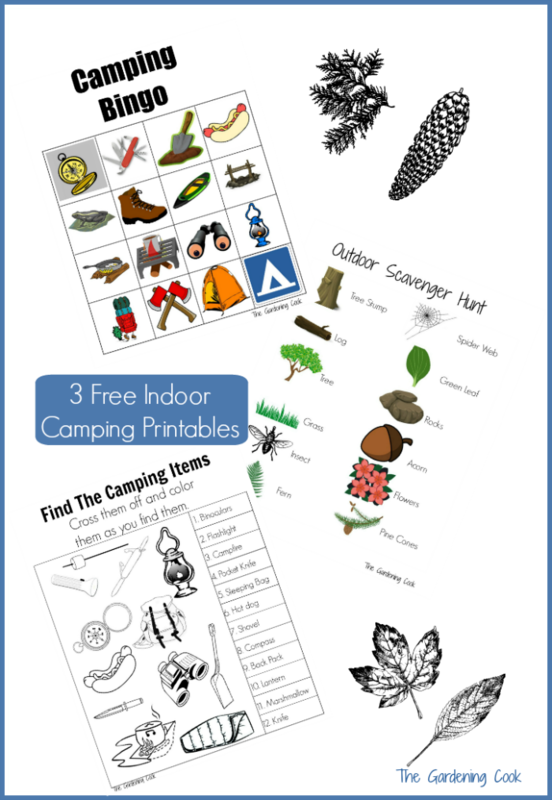 Print out this free Camping Hunt and Color printable with lots of camping items for the kids to find. 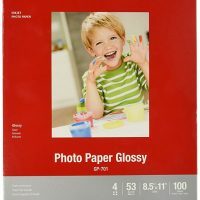 They will cross off each word as they find the item on their sheet, and then color it as they wish, once found. I got these small puzzles and sticker books at my local Dollar store. 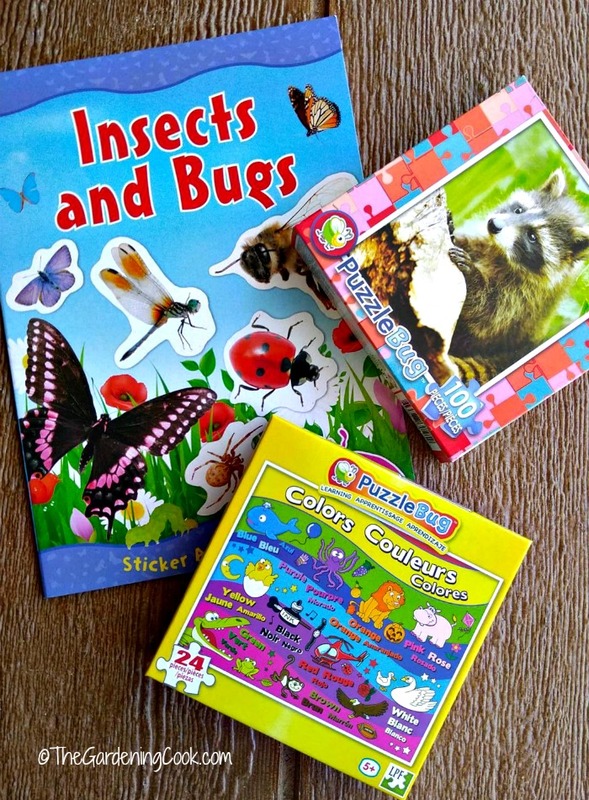 Doing puzzle and sticker activities later in the evening will relax the children and get them ready to start thinking about sleep. It’s almost time for light’s out for the night. Give the kids a small flashlight, lower the lights in the room and have them tell spooky stories to each other, or you can join in and spook them with your fun scary story. Just a note of caution. Don’t make them too spooky, or the kids will be up all night, and that’s not what we are looking for, is it? After a fun evening of games, activities and camping food, your young ones should be ready for sleep now, with a bit of luck. Lights out…Sleep tight…Don’t let the bedbugs bite! Now, if I can just get my dog Baron out of the tent long enough for the kids to get in there for bedtime, I’ll be all set! He doesn’t look as though he plans to move any time soon. This is his new favorite spot! I don’t know what he will do when the indoor camping party ends! Maybe I will just keep it up as a camping doghouse! So, now it’s your turn to plan an indoor camping party. 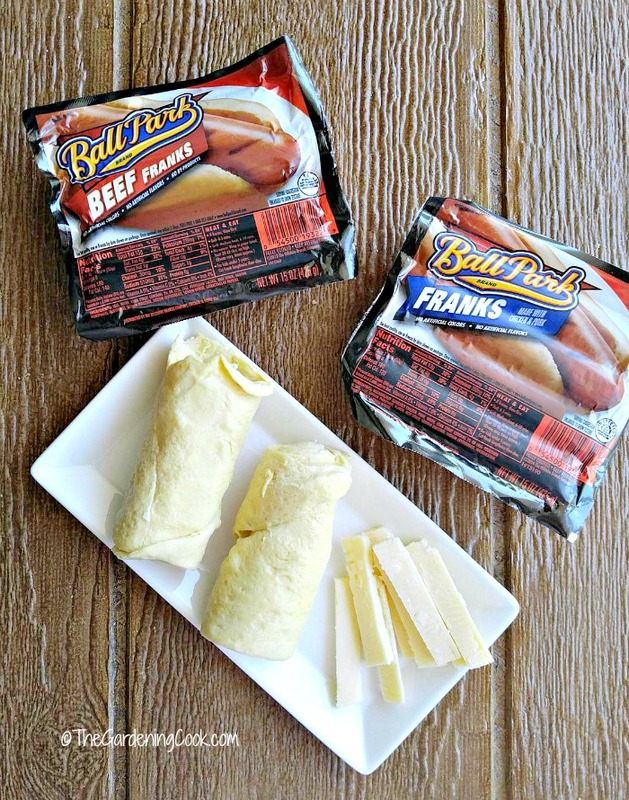 Just head to your local grocery store, and bring home your favorite Ball Park® Hot Dogs, your other party supplies, and then use my easy ideas to fill your fall weekend with fun indoors! 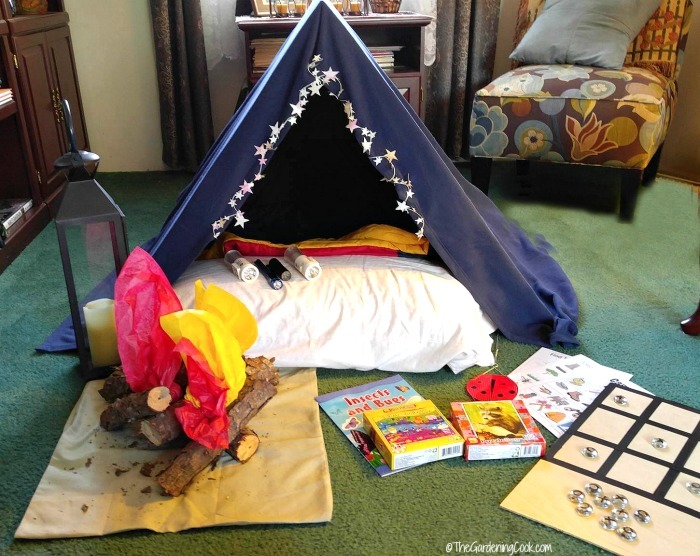 Have you ever had an indoor camping party for your kids? What did you do for your party? I’d love to hear about your ideas in the comments below. Admin note: This post first appeared on my blog in 2016. I have updated the post with a recipe card, nutritional information, some extra games and a video for you to enjoy. Heat oven to 375°F. Cut a slit in each of the hot dogs, leaving 1/2 inch of hot dog on the ends. Insert some sliced cheese into the slit. Separate the crescent roll dough into triangles. 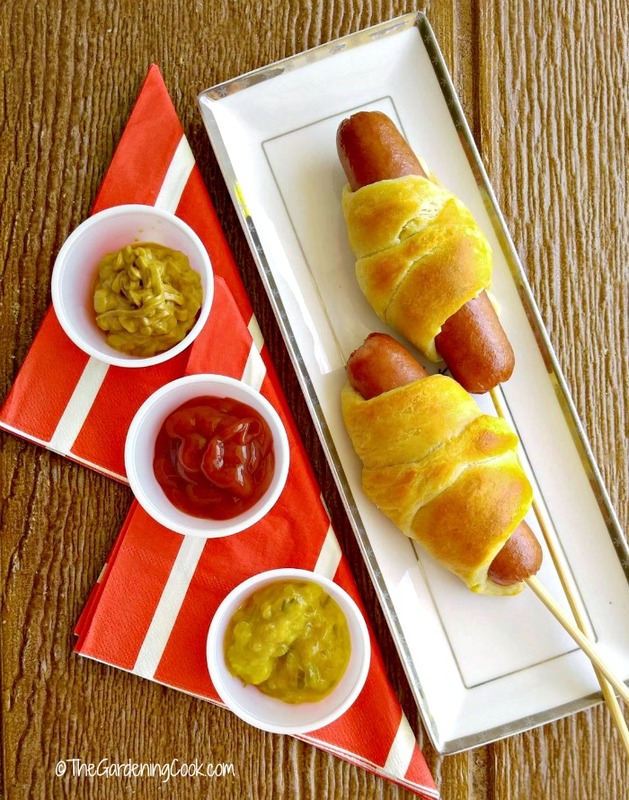 Wrap the triangles around each hot dog, starting by placing the cheese part of the hot dog on the widest part of the crescent dough then rolling. Place on a silicone mat on an un-greased cookie sheet, with the cheese side up. Bake the hot dogs at 375°F. for 12 to 15 minutes or until golden brown. 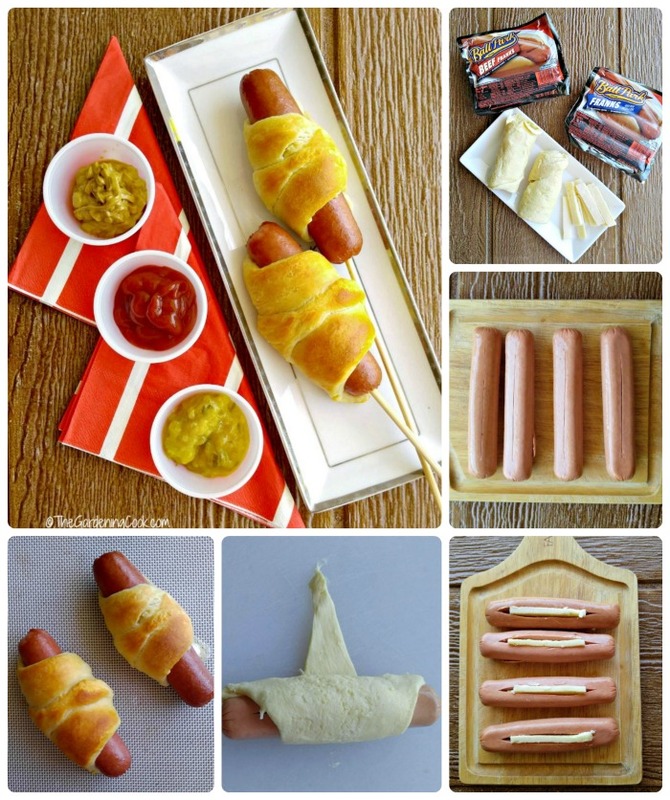 Insert 1 bamboo skewer in each crescent dog. Serve with mustard, ketchup and relish to dip.